Verse 1: it seems clear that they lived in the Valley for quite some time. Lehi’s dream. This labyrinth makes the whole book worthwhile. I too have had dreams that make me deeply question the future and my relationships, that do not simply manifest but engender worry and joy. 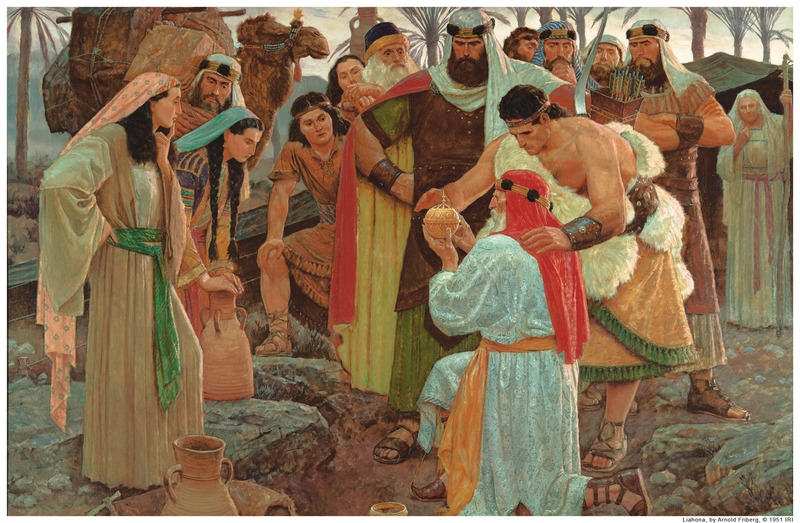 But here we see a dream that not only spawns reflection in the dreamer, but gives future credence to Nephi’s narrative and theocratic reign, shapes a people, is buried for fourteen hundred years, comes to light, and once again shapes another people. This dream is as iconic as anything in Mormonism. I don’t think we pay nearly enough attention to the very first part. Lehi walks in darkness. For hours. Taking the account straightforwardly, this walk in darkness is the overwhelming bulk of the whole dream. Doing as Lehi and Nephi do and extrapolating this vision as a metaphor of our mortal lives, those lives are almost entirely—or perhaps I should say they are built on the foundation of—walking through darkness. Lehi had a guide, but didn’t seem to know if the guide was trustworthy (at least, he says nothing of the guide beyond noting a white robe and that he was beckoned to follow). I also have guides I frequently do not trust, or at least am unsure of; they give me no comfort, just as this guide gave Lehi no comfort. Retrospectively, some of them have been angels. For example, this is the role Stanley Kimball played for me (though at the time I was unsure). I suspect Lehi was conscious of the significance of the dream while he was having it. Neither he nor Nephi expound (in our record) on the darkness. This darkness, though—I can’t get past it—that was the majority of the dream. And what is the first thing that he says he sees after the darkness, after praying for deliverance? A spacious field. How true to life this is. We walk and walk in darkness, until we cry out for deliverance from it, for change, for something. And our pleas are answered with a vision of emptiness. A field. The manifest potential for more (a field can be filled), without there being anything there. These thoughts—are they legitimate? Already I begin to detract from Lehi’s experience, inserting myself. This is unavoidable in scripture, at least to some degree. But it’s conspicuous here, because of the distinct break between our experience of this scene while awake, when Lehi’s experience was in dreaming. There’s a huge difference. In fact, it’s even further removed, because Lehi had the dream, told his family the dream (which of course changes the dream and removes one from the experience of the dream), and then wrote the dream. Nephi later copies it. Now I’m reading it. Wide awake. What I wouldn’t give to dream Lehi’s dream rather than merely read it. But there’s no other way for us to get at it—barring a miracle. This I think, together with Lehi’s consciously articulating the dream, justifies our pulling the dream apart and putting it back together in very un-dreamlike ways. As I’ve already started to do. Again, I still can’t get past the opening. Darkness. For hours. It’s terrifying. Mortality. Struggle. Self-conscious ignorance. Unknown guides who only lead you through more of the same. Darkness. Lehi’s dream begins—and in some ways ends—as a nightmare. Ruminating, perhaps it’s not mere emptiness that Lehi gets after praying for deliverance. The tree also comes immediately into view. And here we have a great contrast. Enlightenment here (as in Eden as Lehi later so eloquently articulates (II Nephi 2)) is an awareness of contrast, one that activates our agency. Beyond the terrifying darkness in which we’re always initially immersed, there’s emptiness, nothingness and the contrasting tree. There’s continued wandering contrasted with an anchored, shareable joy. There’s nihilism, contrasted with a divine loving relationship. This relationship springs up out of the emptiness. There’s no foundation beyond the vast emptiness of the cosmos (what Nephi later calls the world). But this emptiness is enough to background a foreground relationship that allows for joy. When we seek it, we’re delivered from darkness—not to enlightenment or salvation, but to choice. This is what the reality of eternity provides us. Very profound, in my estimation. Thanks for sharing your ruminating and insights. James. I’m sure glad to see this again after the recent disturbance in the Force. I love the dream and Nephi’s as well. They tie together so well and your readings are inspiring in a good way (some critics not withstanding). I recently came across a collection of essays that I think apply here called ‘I Lifted My Eyes and Saw’: Reading Dreams and Vision Reports in the Hebrew Bible. Its edited by Elizabeth R. Hayes and Lena-Sofia Tiemeyer (T&T Clark, 2014). Its from a recent (2011 & 2012 in biblical scholarship terms) meeting of the European Association of Biblical Scholars. In “The Dreams In The Joseph Narrative And Their Impact In Biblical Literature”, Camilla Von Heijne distinguishes between the dreams earlier in Genesis (in which the Lord appears) and Joseph’s highly symbolic dreams in which natural images act unnaturally. While the end of the article goes on to talk about how dependent it appears Daniel is on Joseph’s dreams, I find it interesting that Lehi says, “Behold, I have dreamed a dream; or, in other words, I have seen a vision.” (v.2) Looks like there’s a lot more interesting stuff in this one. Perhaps more later if there’s time. It’s always interesting comparing Lehi’s dream with Nephi’s vision (which he appears to think is the same vision). Further it’s also interesting comparing both visions to their physical travel and then Jacob’s lament which in some ways has them still in the wilderness rather than at the tree.